Search FDO as you would any search engine and get results specific to your grantseeking needs. Begin your search directly from your homepage when you log into your account. One search for all your needs yields: grantmakers, grants, and recipients – it’s that easy! Simply enter a short phrase that describes your work into the global search bar— such as your field of work and where you are looking to be funded. You can now search more intuitively than ever to find what you’re looking for. Remember, it’s best to start your search broadly as grantmakers classify their funding support in many different ways. For example, start your search with “performing arts in New York City” instead of “ballet in New York City.” Drill deeper and see if these grantmakers and grants fit your needs. What you learn from a grantmaker profile will also help you refine your funder search. Include the city your nonprofit is in in your search – and search broader by searching using state – to get a sense of what organizations are sending dollars to your region. Interested in a particular foundation? If you want to search for a specific organization by name, click Search by Organization below the global search bar or use the Organization Name field in Advanced Search & Filters, instead of using the global search bar. Use Advanced Search & Filters to refine your broader search results. With insights from the grantmaker, grant and recipient profiles, consider how you might want to filter further— for example, you may want to see specific transaction types or grants in a certain dollar range. With Advanced Search you can also search for specific geolocations, funders, recipients, or even staff. Only use as many additional filters as required so you don’t miss a funder that may be interested in your work! Select from the drop-down menu options or use the type-ahead feature in the Advanced Search & Filters fields to help frame your search—this will give you other ways to define what you’re looking for and help you identify the results you need. Corporate companies support nonprofits in a variety of different ways, FDO offers a window into many of them. The following are some of the more common means by which companies give. Company-sponsored foundation – A company-sponsored foundation is a separate entity from the corporation. Approaching a company foundation for a grant is just like applying to any other type of foundation. There are usually guidelines and an application process, and these details – as well as a giving history – can be found in FDO. In-kind gifts – Many companies prefer to donate their own products or services to nonprofits. Called “in-kind support,” this can be a good way for a nonprofit to start a relationship with a company. For example, if you run a soup kitchen, you might approach a food company or local supermarkets for supplies. To find companies that offer in-kind donations in FDO, find Transaction Type under Advanced Search & Filters, and select “in kind gifts. Workplace giving – Workplace giving encompasses a number of different programs that encourage and facilitate employees’ donations of cash and/or volunteer time to nonprofits in their communities. Tip: Find out where your volunteers and donors work to find employees that can act as your cheerleader. Employee Matching Gifts: Employers will sometimes match employees' charitable contributions. Volunteer Support Programs: Employees who volunteer in their communities make their companies look good, and employers may offer what’s called “Dollars for Doers" – providing grants to nonprofits their employees support. Also, if you need volunteers, some companies will help organize groups of employees for various nonprofit projects. Pro bono expertise: Some companies will “donate” their professional expertise. Annual Giving Campaigns: Donations through Payroll Deductions can also be set up for employees who wish to effortlessly donate to a worthy cause. However, usually nonprofits must be affiliated with a “pass through” organization, like the United Way or the Combined Federal Campaign. Utilize the Transaction Type filter under Advanced Search & Filters to search for grantmakers who support these types of Workplace giving. donors could perceive a nonprofit as “selling out” to a company not seen as socially responsible. Think like a marketer – what products or services do your donors or clients likely use, and what companies offer them? Also, don’t ignore small businesses in your community. The key thing to keep in mind when approaching companies for any type of support is that they are profit-making enterprises and are looking for some kind of “return on investment” for their philanthropic dollars. Motivations for giving might include getting their name in front of potential customers, keeping their employees happy, or burnishing their reputation in their communities. Your job is to discover what they want and convince them that supporting you is a win-win for all involved. Getting the board to fundraise can be a very challenging experience even when board members recognize that a primary responsibility of every nonprofit board is ensuring that the organization has the resources it needs to meet its mission. To elevate the board’s capacity to engage in fundraising, it can be helpful to engage an outside consultant or consulting firm to facilitate and inform a discussion about the thorny issues that might emerge. A neutral party can help keep the conversation at both a high-level - connected to passion, values, mission and best practices - and a practical level that explores individual challenges, identifies the dynamics of effective fundraising, discusses ways to overcome resistance and examines how a person’s own relationship to money influences their ability to fundraise. Want to learn more about the dynamics of effective fundraising? Join me on Thursday, September 6 for the live webinar How to Establish Expectations for Board Fundraising. No one is born knowing how to do this and some people will be naturally better and more able than others. That said, clear expectations, a strong board/staff partnership, ongoing training, a deep understanding of the program, an engaging mix of stories and statistics, and a deep understanding of how each board member contributes to the development process can make any board member a successful fundraiser. Did you know 90% of foundations don’t have websites? 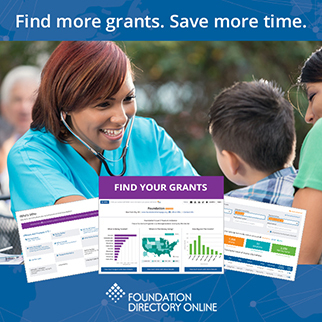 Foundation Directory Online gives you access to key information you need to win funding — find that funder today through FDO! You can search over 140,000 grantmakers and easily see how much support they give, based on your specific mission. Build stronger prospect lists through grant and peer funding insights to win that funding you need to succeed. FDO is everything you need in one fundraising tool. Subscribe to FDO today! Companies used to form a foundation or community relations team and task those staff members with defining what good the company would do in the world. For the most part, the corporate social responsibility initiatives were decided amongst these teams and the nonprofits supported were chosen based on C-suite executive interest. Meaning that executive had a passion for a particular cause, giving pillars were created, and the chosen nonprofit qualified for one of those categories. Unfortunately, the cause partners were not chosen based on sophisticated data and the outcomes of the partnership were certainly not measured for complex impact. What does that mean for nonprofit causes? In response to the more sophisticated analysis by companies, nonprofits must measure outcomes and must report those specific outcomes to their corporate partners. That measurement has to be more sophisticated than ever before to justify the relationship. The nonprofits that understand they have to measure outcomes and proactively provide that data to their corporate partners are the ones that are succeeding – and raising more money for the cause. Cause Impact - what did the company’s time, talent and resources do for the cause in the communities in which they do business. Learn how your nonprofit can successfully measure data on August 16 at 2:30 EST during the webinar How To Use Data To Raise More Money From Corporations. Maureen Carlson will break down what specific data and measurements companies are looking for from their nonprofits partners, and the best way to deliver that data! AI and machine learning are driving change every day to improve communities and solve crucial problems in sectors such as education and public health. AI powers everyday services like Facebook newsfeed or Netflix recommendations to personalize your experience. The ability to leverage data for insights is a prerequisite for keeping pace with rapid changes in the philanthropic sector so that nonprofits and donors can stay abreast and be better prepared to respond — and machine learning is just one way to achieve this. AI and machine learning have been at the core of Foundation Directory Online (FDO) for the last several years. Foundation Center’s data scientist, David Hollander, took us through the implementation of AI and machine learning to make our fundraising research tool possible, and starter tips for nonprofits interested in the potential of AI and machine learning for their organization. Machine learning powers the grantmaker, grant and recipient results you achieve through FDO every day. Machine learning has accelerated the process of coding grants based on Foundation Center’s expert Philanthropy Classification System. The algorithms in FDO are constantly trained and improved to achieve better results. This is how FDO is able to match user queries to their most likely funders. It also enables FDO to gather deeper insights and provide grant data analytics for prospect research. FDO handles vast amounts of data that is parsed and analyzed using AI and machine learning. Powered by our data team’s expertise and supported with machine learning, we are now able to deliver more grant data and insights than ever before. Every year Foundation Center codes a record number of grants for FDO facilitated by AI and machine learning. The more data that is fed into FDO, the more the algorithm trains and improves – and with a record number of grants being coded, the faster FDO learns and improves, empowering FDO users with the most comprehensive data and insights needed to find funding. Interested in AI and Machine Learning for Your Organization? If your organization is new to AI and machine learning, there are several considerations to make before embarking on implementation, including figuring out your data storage, cleaning your data and data integrations. David suggests to first: identify the problem you are trying to solve with machine learning, and second: identify the data you need to solve it. While the applications for machine learning are endless, there are also inherent challenges to overcome. The quality of your data and data bias, how heavily certain data is weighted, influence the algorithm’s results. Algorithm bias can be minimized with better sampling of data and balancing the weight given to specific data. These are just some of the areas to take into consideration. With your organization’s objectives in hand and procuring the relevant, quality data, your data scientists can understand which machine learning models your organization’s data will need to achieve your goals. With so many potential funders out there, grant research can be a daunting task. But with a few simple tricks, grant research can produce amazing results pretty quickly. First off, there is a wealth of information to be found in Foundation Directory Online. Let’s look at a few ways to use this tool to find great new prospects for your current needs. The first step to successful grant research is knowing what you are looking for. Start with a list of the things you need, how much they will cost, and when you need them in hand. Here at Funding For Good, we use our needs list in conjunction to help us determine all the answers needed to be effective in our research. Once you have all the prep work done, you are ready to jump online. Let’s take a look at three easy ways to identify new funding prospects you may not have thought of or didn’t know how to search for previously. Search for foundations that have funded similar organizations in the past. In order to conduct this search, you first need to know the nonprofit organizations who do similar work, their official names, and where they are located. Once you have the basic information, hop on Foundation Directory Online and click the upper right link in the search box that says Advanced Search. Once this box opens, you will see a box in the lower left corner that says Organization Name. In this box, you can type the organization name and choose the one you want to investigate. The search results will show you all the foundations who have funded the organization in the past, the year of funding, the amount funded, the description of what the project funded, etc. Search for foundations that have funded YOUR organization in the past. Here’s a crazy idea that many people new to an organization or new to the world of nonprofits never think about: Who has funded us in the past? Many organizations don’t have stellar records about foundations that have given them grants previously, what the money was used for, or how much was granted. Crazy, but true! Refer to #1 and run that search on your own organization. See who has given to you in the past. Has a foundation that has an interest in your work been neglected? Perhaps you need to revisit some past supporters and get them back in the fold. Search for foundations by Geographic Focus. Do you know all of the foundations that provide funding in your county, in surrounding counties, or in your region? Would you like to? I know I love using that information when I’m researching prospects for a specific area. It’s easy peasy with Foundation Directory Online. Simply go to the Advanced Search link and type in the county and state in the Geographic Focus box (top row, center box). You’ll see the list of all foundations that award grants in that county appear. Now you can research all the foundations that send funding to a geographic area and see who might support your work. Do this for each region in your service area or where you have an impact. You might be surprised at some of the prospects you uncover. Two additional tidbits to keep in mind. Tidbit #1: Don’t limit yourself to super specific Subject Areas in your search. Many foundations will give to a variety of organizations, so using more general terms will lend to better results. Tidbit #2: Don’t freak out when you see “We only fund pre-selected charitable organizations” or “We don’t accept unsolicited proposals.” To learn more about these two phrases and what they really mean, check out this blog: The Dreaded Phrases of Grant Research. MANDY PEARCE is a grant writing expert, executive coach, and national fundraising trainer who launched Funding for Good, Inc. in 2009 to equip organizations with the skills and tools needed to become successful and sustainable. Mandy has taken her passion and expertise for fundraising to the development field and shared it with individuals and organizations for over 21 years. Her dynamic teaching style brings thousands of people annually to her presentations at conventions, trainings, and workshops. Mandy lives in Hickory, NC with her husband and their rescue dogs, Leo and Dalli, who share her enthusiasm for the outdoors. We’re excited to announce a new powerful feature in FDO is here: Interactive charts on recipient profiles. New Recipient Charts provide insights you can leverage in your research and when you’re searching for new funding opportunities. But how do Recipient Profiles help your funding search? With Recipient Charts you can quickly see grantseeking trends and organizational insights to help guide your prospecting, find new prospects and better understand how to approach potential funders. The first Recipient Chart gives you insights on the types of funders giving to an organization and the percentage of total funding each type of funder makes up of the organization’s grant portfolio. With this funder proximity chart, you see how much money is being awarded from each of these geographic areas and the percentage of total funding each geographic area makes up. These first two Recipient Charts can be viewed by Grant Amounts or Number of Grants. The third graph will help guide you on the optimal amount to request from a funder. With this grant size graph, you can understand how much funders are giving to peers and the size of those grants to see how much those funders most commonly give. New Recipient Charts are available in the new FDO, Professional. Join us for a live webinar on May 1st (2:00PM EST), where we’ll introduce new Recipient Charts, discuss Recipient Profiles, and provide a tour of the new FDO. What are the chances the funder will get in the car with you after that response? When your nonprofit is focused solely on the achievement of its own tasks without a concrete idea of how you’re making a difference in the lives of those you serve, you are essentially doing just that. You’re heading down a path without a clear sense of where your efforts should be taking you. The idea of nonprofits giving this response comes from the book Leap of Reason, a sector-wide call to action emphasizing the importance of defining your organization’s intended outcomes (i.e., your desired changes and benefits) to maximize impact. For almost 20 years, I’ve been helping organizations do just that. And I can say from experience that organizations can easily fall into the trap of focusing too much on what they do, as opposed to why they’re doing it. To continue the driving metaphor, I like to compare impact-focused program planning to using your car’s GPS. Think about it. In order to use a GPS, you must enter your desired end point. Along the way, you may need to “recalculate” due to unexpected roadblocks or opportunities. But the GPS always keeps in mind where you want to end up. You can accomplish the same thing by identifying your program’s desired impact and then planning accordingly. When you use an outcome-focused framework like a logic model, you can strategically plan your route before you begin. You can factor in the time it will take to complete your activities, the resources you have available and those you need, and other potential variables that may emerge. You can see how all the pieces should work together. Think of a logic model as having an impact-focused “road map” in hand while delivering your program. The map allows you to understand how you’re progressing and to make adjustments along the way, all while keeping a constant eye on your final destination. For example, you may run a program that aims to improve the in-class experience of high school students so they learn more and are positioned for future success. But what if your work does not involve any direct contact with the students? Instead you train teachers on classroom management and instructional strategies to apply to their work. In order to effectively deliver your program, you must go into the planning process with clarity about the needs and preferences of both groups: those with whom you’ll directly interact (the teachers) and those whom you ultimately hope to benefit (the students). Otherwise, it’s easy to get lost along the way. Let your outcomes inform your approach. After you’ve clarified whom you intend to impact and why, try to articulate how you hope they will be different as a result of your intervention - both in the short-term and long-term. You might ultimately seek changes in their behavior or condition, but what kinds of short-term changes in access, knowledge, attitude or skill are critical to getting there? As anyone who has struggled to stick to a New Year’s resolution can tell you, short-term outcomes are often key to achieving more meaningful and lasting change. Being clear about them upfront will help ensure your approach is purposefully designed to support them. Consider there’s more than one path. Just as a GPS often illustrates various routes, planning with an impact focus can uncover more than one feasible approach. If you start by taking the steps outlined above first, you may discover that the way you thought you had to go or the way you’ve always gone is not the only way. In fact, by letting your outcomes drive your activities, you may discover an even more efficient and effective route to success. Not sure if you have the time to use a logic model to plan ahead? Remember your chances of getting funding depend on it. Do funders want to partner with someone who wastes time and energy on a trip with no clear purpose? Probably not. So you should take a little time to strategically map out your programs with an outcome focus. Get started on the right path. Avoid wasting valuable resources. And put yourself in a position to maximize your impact. Have you ever wondered how cryptocurrencies might be leveraged in the social sector and how your organization could benefit from them? Man on A Mission Consulting presented at Foundation Center West on just this, cryptocurrency and its benefits for the social sector. In his talk, Bitcoin for Good: Digital Currencies and Blockchain for Nonprofits, Paul Lamb discussed how nonprofits and foundations are currently using cryptocurrencies, and how social sector organizations might start adopting them. Because cryptocurrencies are independent from financial institutions, donations are more immediately processed and available for nonprofits’ use. Cryptocurrency donations can, in most cases, be quickly converted into dollars upon receipt. Some nonprofits have experienced challenges with conversion times; however, this depends on the conversion or “wallet” provider. Blockchain, which is used to secure cryptocurrencies, can also help donors better track the impact of their dollars and increase transparency. There are blockchain systems now in development (i.e., Givetrack.org) which allow a bitcoin donor to see in real time how the nonprofit is spending their donation. This will help donors see how their dollars are used, and help nonprofits with reporting. A few foundations and funds, such as the Silicon Valley Community Foundation and the Fidelity Charitable Giving program, are using cryptocurrency to make grants. As with donations , if grants are given in cryptocurrency, they can more quickly be converted into dollars for the nonprofit to use. Cryptocurrency is birthing a new type of donorship, and has already given rise to a new kind of donor-advised fund. The Pineapple Fund is an anonymous donor organization that has already allocated $56 million to various charities. In the future, we may see types of Distributed Autonomous Organizations (DAO) that operate cloud-based tokenized donation and charity management systems. Through a DAO, donors could vote on where donations are made and even drive the development of independent projects based on majority token rule. This is new, uncharted territory, not just for the social sector, but for society as a whole. There are many lessons to learn about how best to use these technologies, and many discoveries to uncover about how they may impact the social sector. For more information on cryptocurrency and blockchain technology use in the social sector, check out Lamb’s list of resources here and his recent post on Medium.